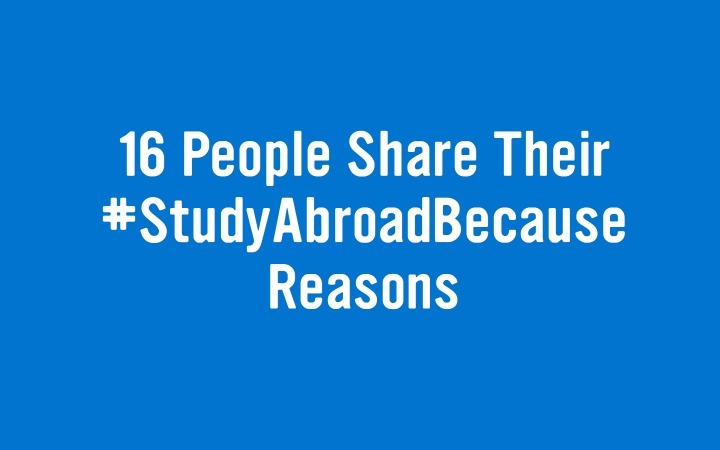 As I was checking Twitter I noticed my timeline was taken over by #StudyAbroadBecause. Set up by Air BnB and The White House to promote studying abroad … but the reasons are international and if you are doubting about doing a semester abroad let these encouragements convince you. Have you been abroad? What were your reasons? #StudyAbroadBecause it's the most amazing experience, and you'll learn so much about a different culture, the world and yourself. I'd #StudyAbroadBecause the US is only small drop in the pond. Nothing better than being immersed in culture for an extended period of time. #StudyAbroadBecause you can get out of this terrible, horrible place. #StudyAbroadBecause it’s a great way to learn first-hand that other countries actually exist. #StudyAbroadBecause: best way to master another language, understand people w/ different life experiences, & truly care about human #race. #StudyAbroadBecause it'll be the best decision you ever make. #StudyAbroadBecause our world is filled w/ phenomenal, beautiful people, rich traditions & vibrant cultures. Studying abroad is magical! #StudyAbroadBecause it will help feed your innate curiosity & enable you to lead an interesting life filled with diverse perspectives. #StudyAbroadBecause you'll meet new people, make amazing friends & learn so much about yourself! #StudyAbroadBecause understanding another culture matters and makes you a better citizen of our country and the world. Definitely a great hasthtag & use of social media. I’ve never studied abroad, only travel. It was amazing & I feel like everyone should get out of their country to see the world if they can. Interesting post! I love all these reasons – especially illuminating your book education. We are constantly seeing pictures and videos of places in the world, but actually getting out there is an entirely different feeling! Great hashtag!! After I studied abroad once I just thought it was not enough. I waited for my graduation and went abroad again for another semester. After a few years, I started working abroad. Anyway, it makes you want more, you meet very interesting people and above all, you’ll learn to speak new languages! !